Mark Boulos, Comrade Teteng II, 2010, C-print, 26 3/8 x 39 3/8". 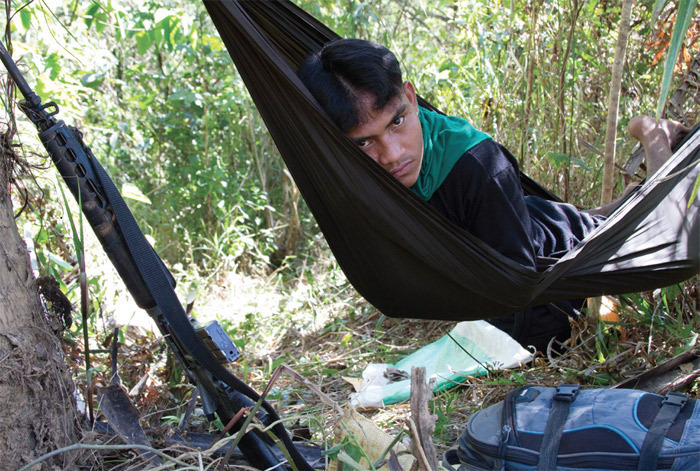 In his large three-channel video installation, No Permanent Address, 2010, Mark Boulos presented the rugged life and personal stories of members of the New People’s Army (NPA), a Communist guerilla movement in the Philippines designated a terrorist organization by the EU and the US. The artist spent eight weeks living among two of the group’s peripatetic squads to make the twenty-seven-minute-long video. The footage shows the company’s members trekking through dense jungle, conducting military routines, and resting on hammocks strung between trees. Short interviews with individuals shed light on their reasons for joining the NPA and the sacrifices they’ve made along the way.